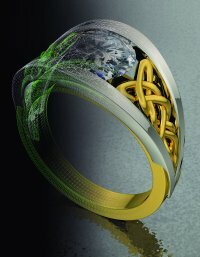 Austin & Warburton is leading the trend towards computerized custom design with Matrix 3-D Jewelry Design Software. 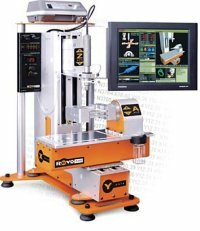 This state-of-the-art system allows customers to see their design from every angle before it is even made. Details can be seen on screen and in scale so you get exactly what you are looking for. Whether you want to remount an outdated ring or custom design your dream necklace, creating it with CAD/CAM is the most accurate way to do it. Designing jewelry used to be a tedious and imprecise process. Traditional methods include hand-sketching the item then hand-carving a wax model for the customer to approve. If changes need to be made, the process starts over. With the addition of this advanced technology Austin & Warburton can create the precise design that you are looking for in less time. Once you approve the 3-D design on the screen, the file can be sent to a machine that accurately carves a prototype out of wax. This wax will then be transformed into a quality, custom designed piece of fine jewelry. Matrix 3-D was created by Gemvision Corp. in Davenport Iowa, a company specializing in technology for the jewelry industry. Austin & Warburton sent staff members directly to their headquarters for extensive training on Matrix 3-D. This technology and training will advance the creativity and precision of all jewelry designs created by Austin & Warburton. We invite you to visit our store to see for yourself how this revolutionary software is perfecting the art of custom design jewelry.